Home > Holiday Decor > Valentine Garden Gifts > Mankini Gnome Statue - 12" OMG! 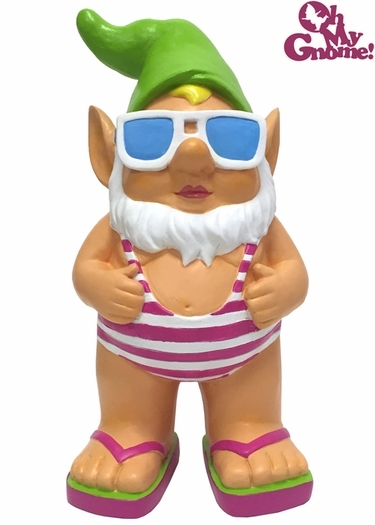 That's right, our newly released OMG Mankini Gnome Statue certainly is comfortable with his body, his fabulous style, and shakin' his groove in the sun! This fun-sized 12" beach garden gnome is ready for summer fun sporting his new pink and white stripe (G-Rated) Mankini swimsuit. It's no time to get bashful; it's time to let it all hang out in the sunny weather! Hysterically entertaining for all your pool parties and garden visitors.